Hard disk drives using magnetic recording have been around for 60+ years. Despite using the same underlying technology, the hard drives of today look nothing like the refrigerator-sized ones from the 1960s. The more interesting aspect in the story is the set of advancements that have happened since the turn of the century. At a high level, hard disks are composed of circular magnetic plates or 'platters' on which data is recorded using magnetization and the patterns of magnetization represent the data stored. The patterns are laid out in terms of tracks. They are created, altered and recognized with the help of 'heads' mounted on an actuator that perform read and write operations. Modern hard disks have more than one platter in a stack, with each platter using its own individual 'head' to read and write. There are additional hardware components - the motor, spindle, and electronics. The segment of interest from a capacity perspective are the platters and the heads. The slide below shows two ways to increase the capacity of a platter - increasing the number of tracks per inch (TPI) and/or increasing the number of bits per inch (BPI) in a single track. 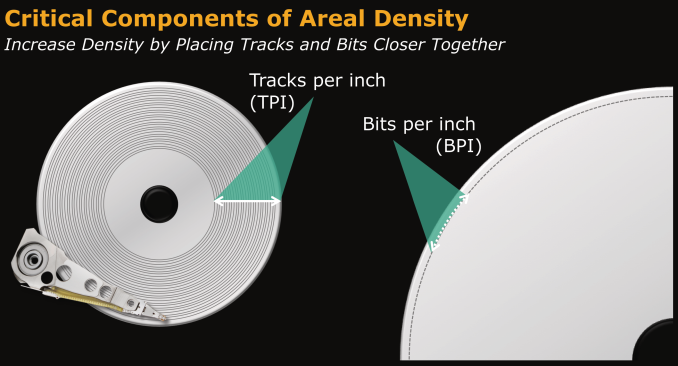 Together they yield a metric for areal density, which the industry gives as a value in bits per square inch, such as gigabits per square inch (Gb/in2) or terabits per square inch (Tb/in2). Hard drives in the early 2000s primarily relied on longitudinal recording, with the data bits aligned horizontally in relation to the spinning platter - this is shown in the first half of the image below. One of the first major advancements after the turn of the century was the introduction of perpendicular magnetic recording (PMR) in 2005. At the time PMR made its breakthrough, Hitachi commissioned an amusing video called 'Get Perpendicular', which was used to demonstrate this technology and reaching 230 gigabits per square inch. The video can be found here. PMR was developed as a solution to the previous areal density limits of around 200 Gb/sq.in caused by the 'superparamagnetic effect' where the density of bits would cause the bits to flip magnetic orientation and corrupt data. 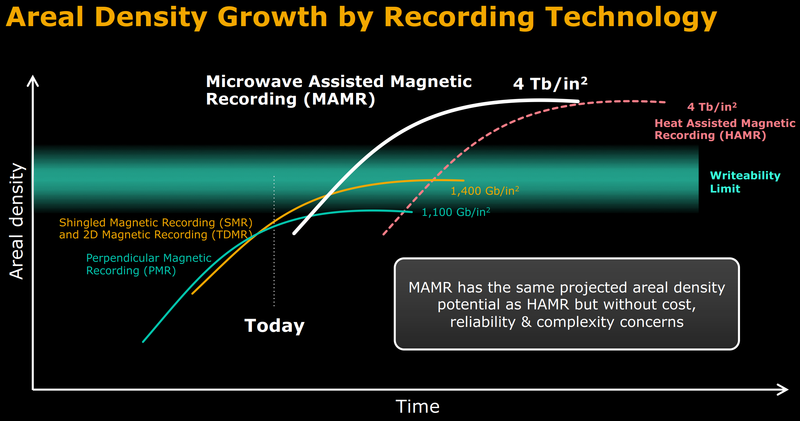 PMR, by itself, can theoretically hit around 1.1 Tb/sq.in. Helium-filled drives: One of the bottlenecks in modern drivers is the physical resistance on the heads by the air around the platters. Using helium reduces that resistance, albeit, with the requirement of sealed enclosures. The overall effect is improved head stability and a reduction in internal turbulence. This allows for a shorter distance between platters, giving manufacturers the ability to stack up to seven in a single 3.5" drive (rather than the usual six). Helium drives were first introduced to the market in 2012 by HGST. The latest helium drives come with as many as eight platters. 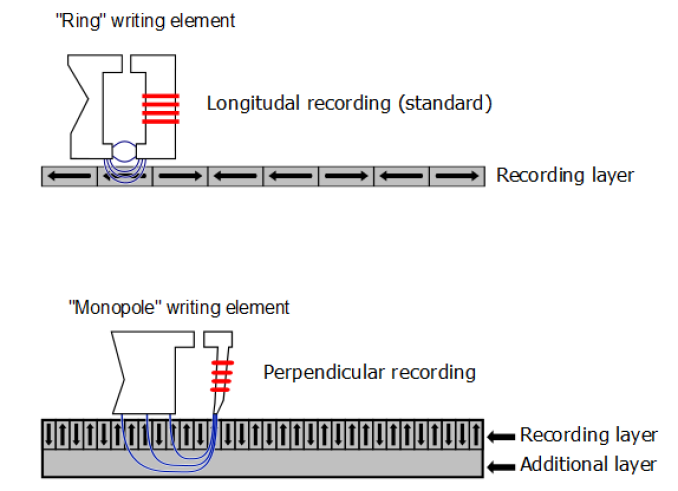 Shingled magnetic recording (SMR): In this technology, the track layouts are modified to give overlaps, similar to how roof shingles are laid (hence the name). While this creates challenges in rewriting over areas already containing data (the need to avoid overwriting valid data that has to be retained), there are sub-technologies and methods to mitigate some of these issues. The challenges can be either solved on the host side or the drive side. Seagate was the first to ship drive-managed SMR drives in 2013. Improvements in actuator technology: In the last few years, Western Digital has been shipping 'micro actuators' that allow for finer positioning and control compared to traditional actuator arms. This directly translates to drives with a higher bit density. Improvements in head manufacturing: Traditionally, PMR heads have been manufactured using the Dry Pole process involving material deposition and ion milling. Recently, Western Digital has moved to the Damascene process (PDF) that involves a etched pattern filled using electroplating. This offered a host of advantages including a higher bit density. We had briefly mentioned PMR technology having theoretical limits earlier in this section. Traditional PMR can deliver up to 1.1 Tb/sq.in. with improved actuators and heads. 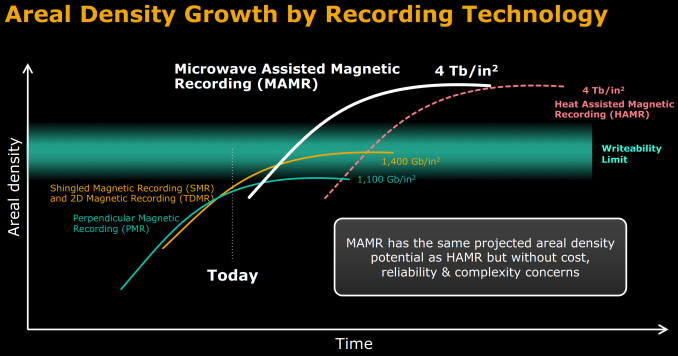 Use of SMR and TDMR (Two Dimensional Magnetic Recording) can drive this up to 1.4 Tb/sq.in. At those areal densities, the TPI and BPI need to be so high that the media grain pitch (the smallest size that the metallic elements that store individual bits can be) is around 7-8 nm. These small grains present a number of challenges, such as the head not being capable of creating a strong enough magnetic field for stable recording. One solution to this would be to make it easier to write the data to the grain. Decreasing the resistance to magnetization (technically, lowering the coercivity), allows the head's field to modify the magnetic state of the grain. This requires extra energy, such as thermal energy, to be directly applied to the grain for the short amount of time that is needed to write a bit. This is the point where the 'energy-assist' aspect comes into the picture. Over the last several years, a lot of focus has been on heat-assisted magnetic recording (HAMR), where the lowered resitance (coercivity) is achieved by locally heating the grains using a laser. This brings in a number of concerns that have prevented mass production of drives based on HAMR technology. MAMR, on the other hand, uses microwaves to enable recording. A primary reason for MAMR not being considered as a viable technology by industry analysts so far was the complexity associated with designing a write head to include a microwave generator. 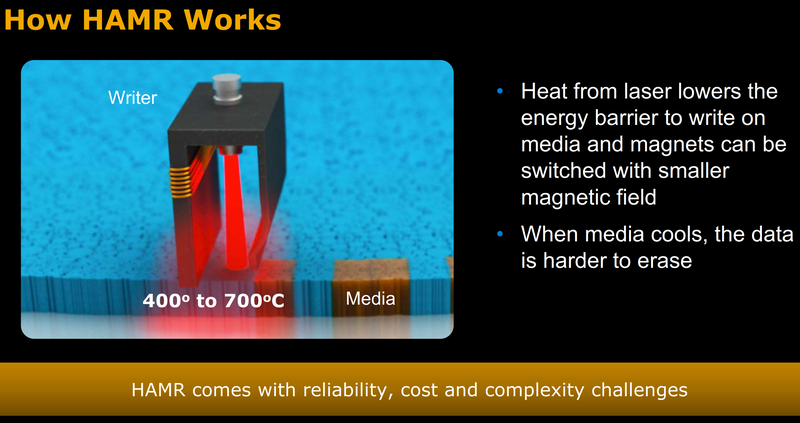 In the next section, we take a look at how Western Digital was able to address this. It's all in how your pronounce it.